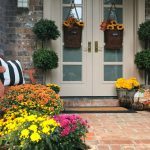 Welcome to another fun blog hop decor tour. 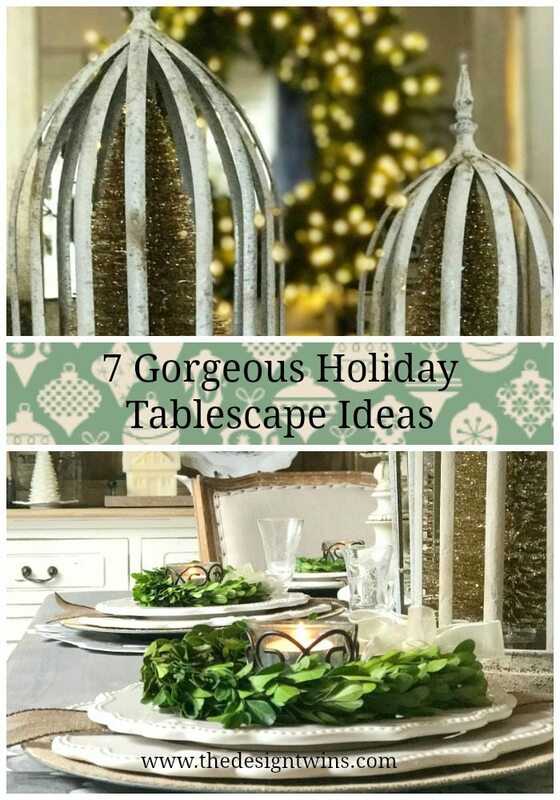 This one is all about creating a Gorgeous Holiday Tablescape. Jodie and I are very grateful to Janine, our amazing friend and blogger extraordinaire, for organizing and hosting this tour. 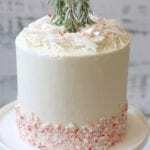 The holidays are a wonderful time to get lots of ideas for your entertaining and family events. 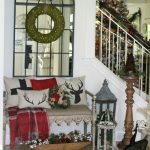 But, truth be told, all of the ideas presented can be applied to any seasonal theme throughout the year. If you have arrived from our dear and talented friend Summer, She Leaves A Little Sparkle, an extra special welcome! She is what we call a hard act to follow 🙂 However, I’m always amazed at how each of us fellow decorators has a totally different take on the same topic, creating a wonderfully diverse experience if you complete the tour. 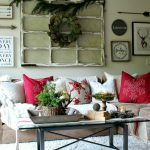 So, I hope you will stay tuned to join our next gifted decorator, Joan, 2 Ladies and A Chair, on her tour so you don’t miss any of the awesome holiday inspiration. Enjoy! I LOVE decorating my dining room. I’m not really sure why it’s my favorite room to decorate. Maybe it’s the beauty of the chandelier, maybe it’s the built-in drama of the crown molding. It could be the relative clarity of purpose in a dining room. I mean, it’s hard to go wrong with form and function. All this being said, I have struggled since I moved into my house, always dreaming of ways to make the room live up to the vision in my mind. The excitement I have today is that I finally feel like I have achieved what I’ve been working toward steadfastly for 2 1/2 years. The grand finale of my dining room decorating expedition was the arrival of my new dining table. 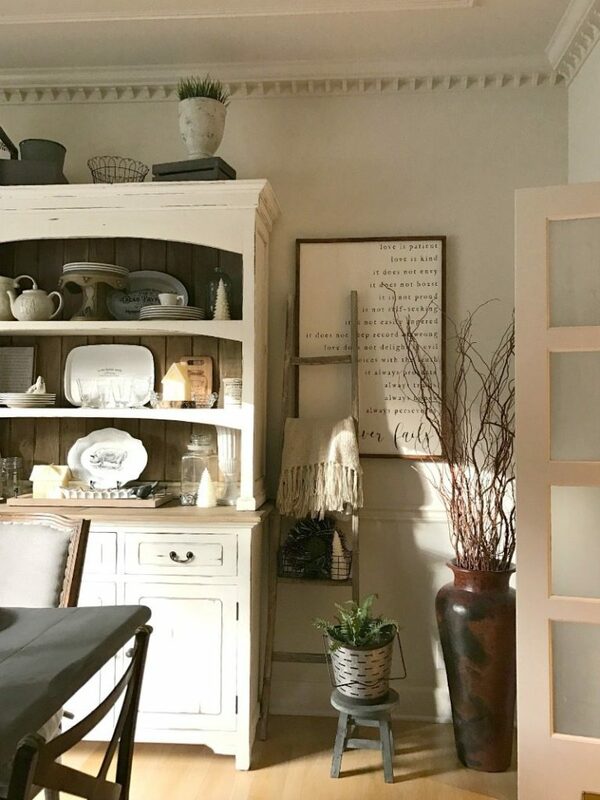 The beautiful gray wash of the farmhouse table completely inspired a restyling of the room. This happened just in the nick of time for my Holiday Tablescape. I decided to remove all traces of red and turn the color palette to gray, cream, & white, with pops of green. 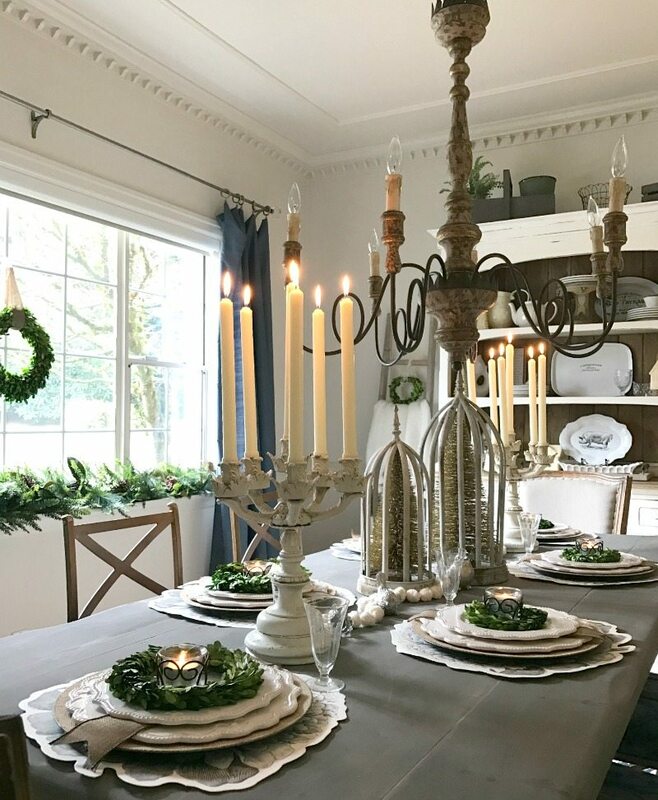 I love the look of these cream alabaster candelabras with the gray of the table. These two colors mix beautifully. 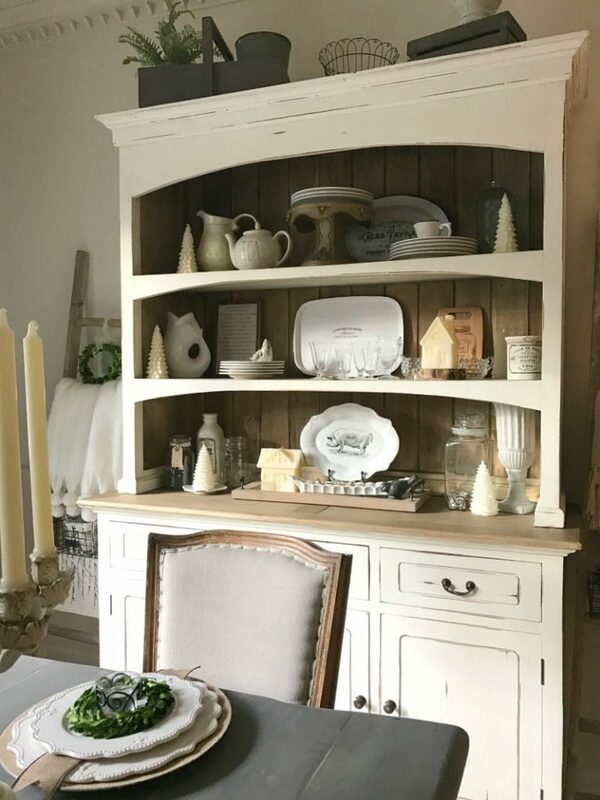 I also love the rustic farmhouse style mixed with the old-world elegance of the antique pieces. To continue the soft mix of these I brought out my creamy white plates. 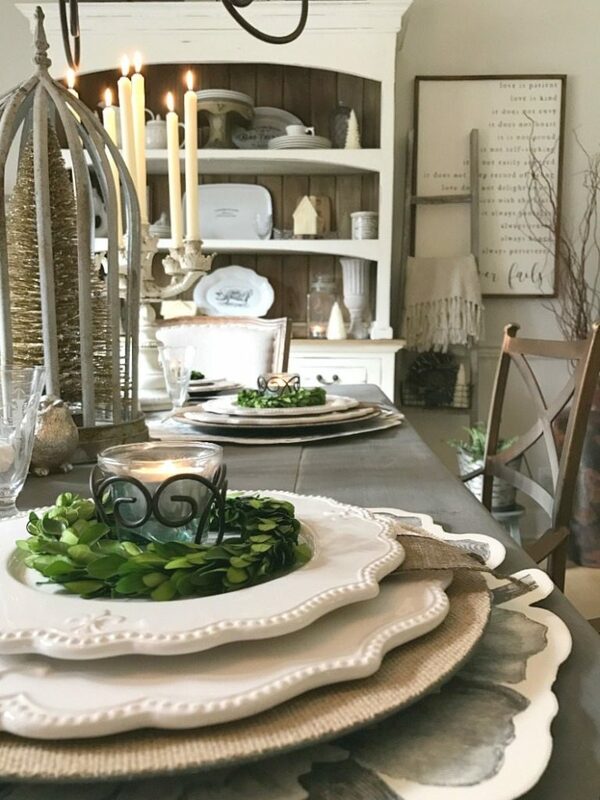 The best part about these plates are the scalloped-edged, fleur-de-lis details that make these plates anything but plain. Now, this may seem like a lot of colors but silver is a version of gray, a “fancy” version. And tan or burlap goes right along with cream. I love mixing variations of shade of the same color. These days I also love to mix metals, so where there is silver I usually welcome gold. It adds interest without conflict. 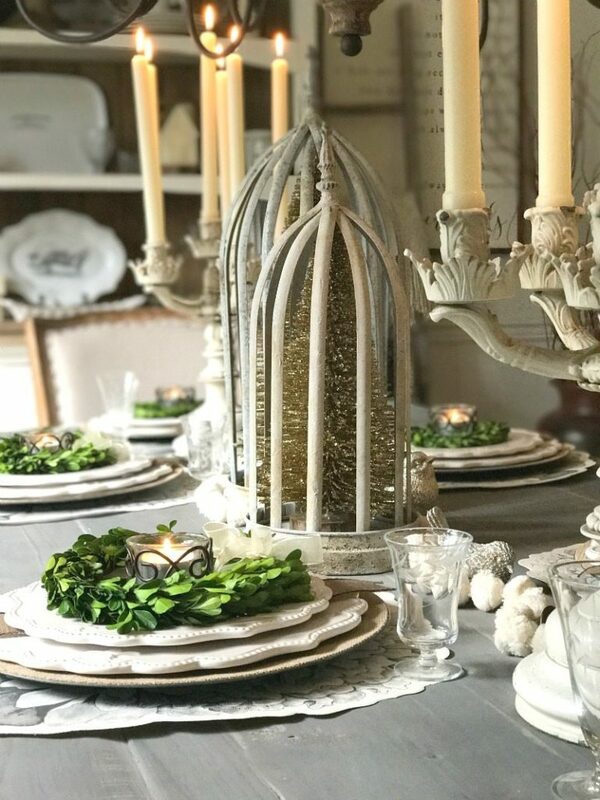 To follow the mood set by the antique alabaster candelabras I decided to bring out my grandmother’s antique champagne glasses. These delicate, old-fashioned beauties added just the right touch of understated elegance to complete the look. The lead players in the center of the table are the antique alabaster candelabras. They strike a commanding pose. Then in the very middle I have two antiqued gray washed “cages”. Inside are two gold bottle brush Christmas trees. In between all these statement-makers are the details. These details are important and act like glue to the presentation. They help the large items look like they are not floating. They also help connect everything. 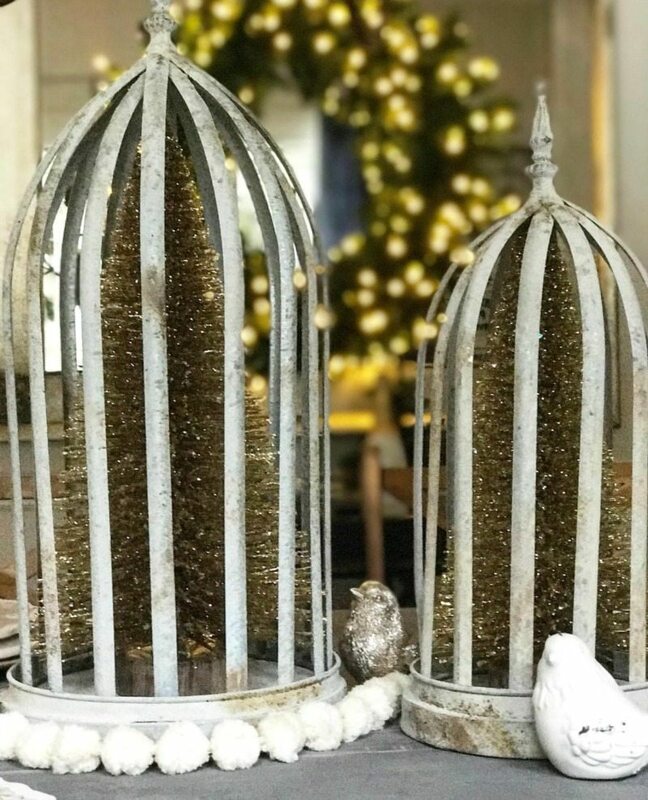 I used miniature birds (to go with the theme of the cages). Connecting everything is a cream colored miniature pom-pom garland. The goal is always to have enough detail and decor without overdoing it. Who is to say how much is enough? This question is subjective for sure. You will have to judge for yourself and do what pleases your personal aesthetic. Style and functionality rolled into one….quite literally as mine is on wheels! 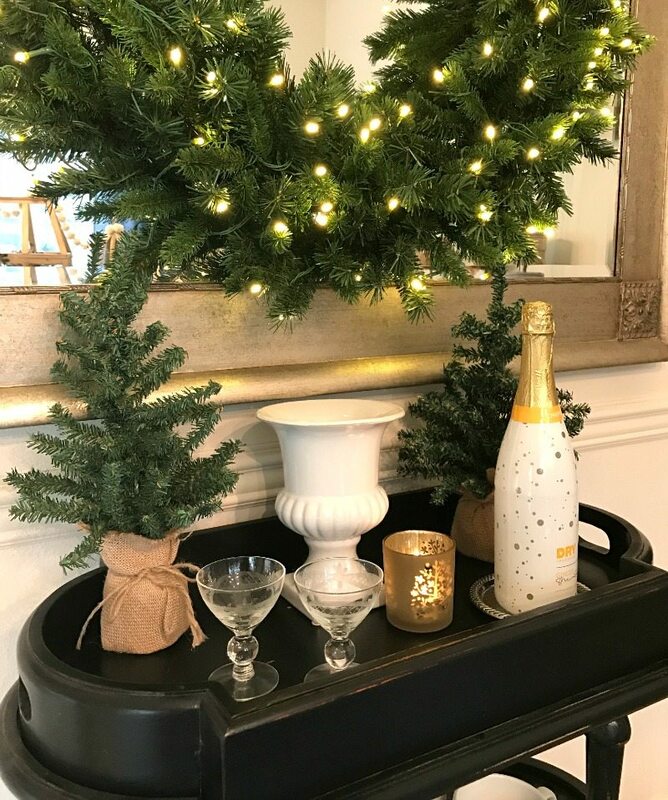 A bar cart can be festive and functional! Serve up your favorite drinks and decorate with simple holiday details. 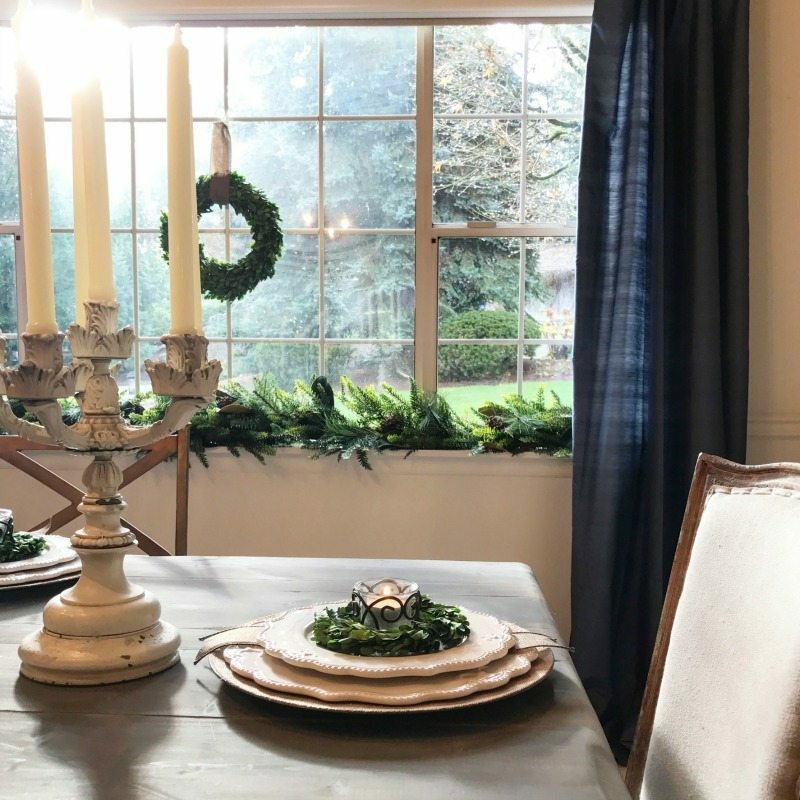 I hope you enjoyed my Holiday Tablescape! Next please head on over to the fabulous Joan, 2 Ladies And A Chair. She never fails to truly inspire us. We know you’ll be so happy you did. Below we have included affiliate links for your shopping convenience. There are some exact products I used in my room and some that are similar. Other items are recommended and are things I wish I had! Happy Shopping! So in love with your dining room! I love your play of textures and the way you mixed them up. Your color scheme is gorgeous! Merry Christmas to both you and your families! Oh this is absolute perfection! I love neutrals and greenery. 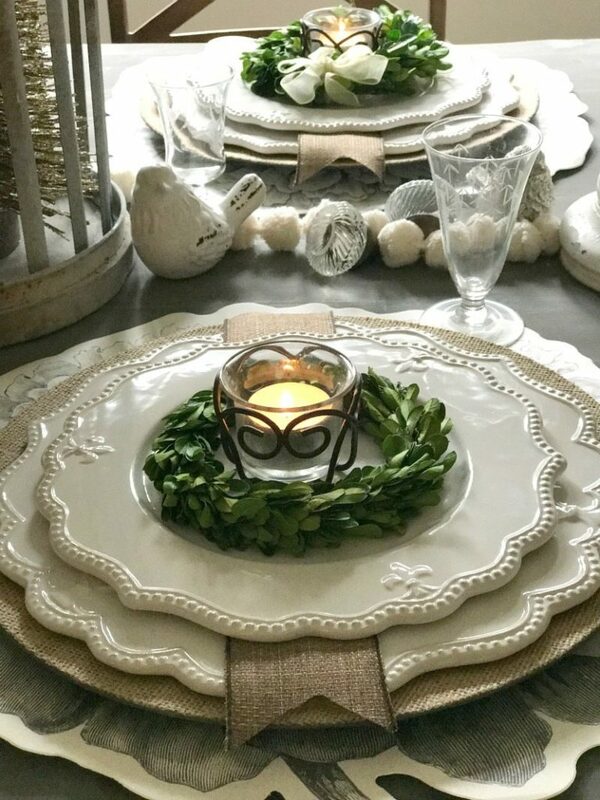 Boxwood is always a favorite of mine and I absolutely love the pretty plates with the boxwood in the middle. Such a classy and stunning, yet cozy table and dining room. And thank you for your kind words!! Love you girls!! Muah!!?? Of course, your dining room is stunning! I just love all your elements and how they are so beautiful together! That is way cool that you have your grandma’s glasses, and they are so beautiful! Oh my, I so love your buffet, I studied everything that is displayed, and I would love one just like it! Thanks so much for joining us on our blog tour, you two add so much to our blogging group! Oh….MY….GAWD….? YOUR PICS LOOK EXQUISITE! 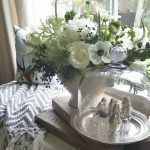 I am head over heels for your moody lighting and beautiful tablescape!!! Jodie, you really delivered! Also, love all the glue ! ? I agree with you 100% ! There needs to be glue to hold everything together. The details are everything! I try and explain my client this when I present accessories to them. Sometimes they don’t get why we need those decorative items! Alone they might not make sense but all together it’s like magic! And your dining room is a perfect example! Julie what a darling tablescape! 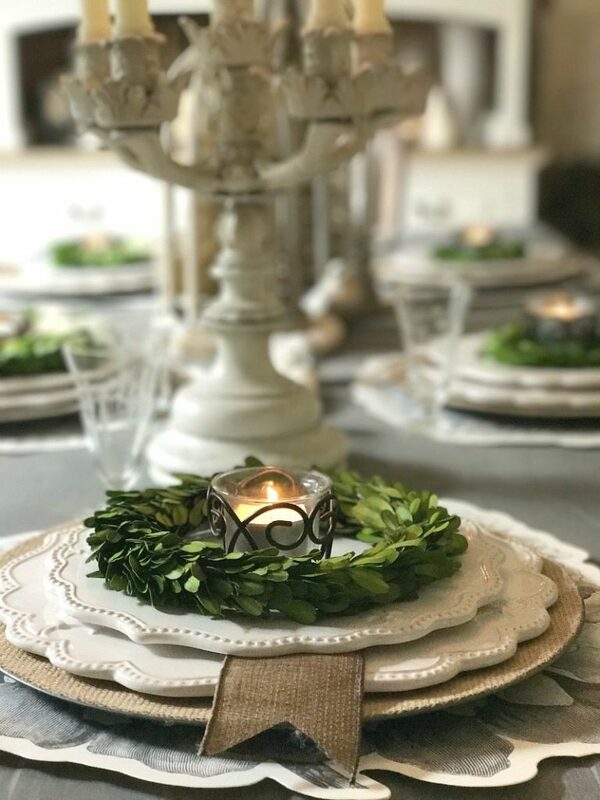 I love your neutral color palette with all the boxwood wreaths and I especially love the alabaster candle holders!! Soo gorgeous!! It is such a pleasure to do another hop with you, you always have such great ideas! Thank you to both of you for your support and encouragement through all the hops – I have so enjoyed doing them with you! Very nicely done ladies!! I love all of the details down to the little birds in the center of the table. Those candelabras are fantastic!! 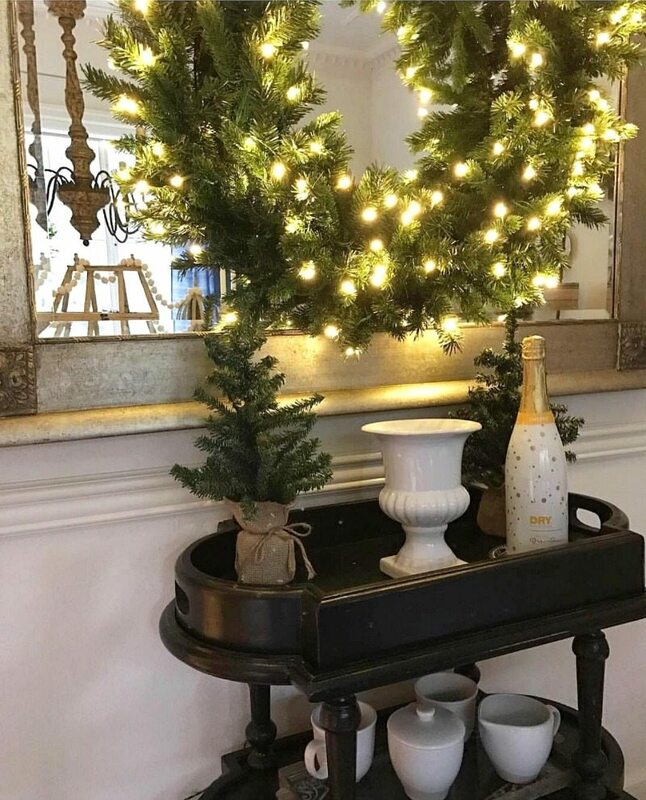 Could you please tell me where you purchased your bar cart ? I absolutely love it !! 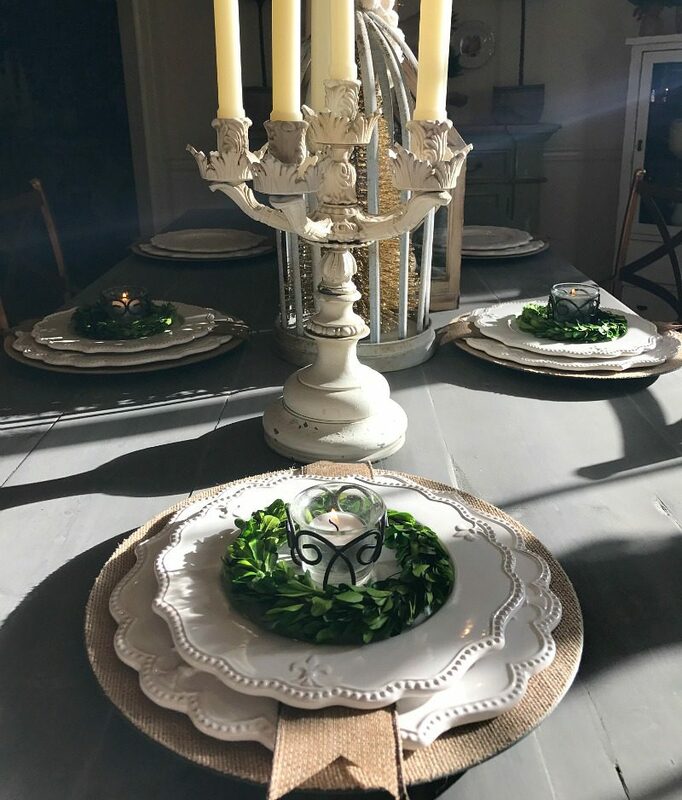 I’m taking a peak at table decor as easter is coming up and I’d love to do a cute table scape for my family. I’m currently building our new kitchen table and what better way to showcase it than to dress it up a little! I love everything about this tablescape. I always notice and admire your girl’s beautiful glassware. Besides any passed down from family, have you picked any up at garage sales or thrift stores? I’ve purchased a set at a garage sale and my mother in law gave me her mother’s glassware which I treasure. I’m just in awe with you girls. You make me smile. ??????????? ?